We have the best job… ever! Yes, it’s true. Every day we comb through manuscripts, chat with authors, develop relationships, and build a community of creative artists. It’s wonderful! Reading manuscripts from authors with the end-game for publication. 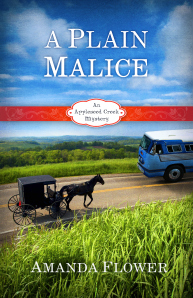 Author Amanda Flower wrote her fourth and final book in the Appleseed Creek Mystery Series, and we were fortunate enough to get the sneak peek, to assist with the edits, and to gain bragging rights that we were one of the first readers! How amazing is Amanda? Talented and generous! The Amish community in Appleseed Creek’s new bishop believes the best way to help his district in the struggling economy is to increase tourism. He invites Blue Suede Tours from Mississippi to visit the community and asks his district to host the southern visitors. The Troyer family agrees to participate in the tour with an old-fashioned milking demonstration on the family’s dairy farm. But when two Mississippians die during the milk taste test, the local police chief believes someone poisoned them, and Timothy Troyer’s father is her number suspect. Computer whiz, Chloe Humphrey, jumps onto the tour bus as an undercover tour guide in order to prove her boyfriend’s father is innocent despite the Troyer family’s reservations about her and Timothy’s relationship. If they solve crime, will Chloe and Timothy finally prove that they belong together or will the investigation be the final act to tear them apart? Amanda is represented by Nicole Resciniti of The Seymour Agency. Connect with Amanda through her website: http://www.amandaflower.com.